The census is creating a difficult tension for activists. Many folk are reluctant to fill it in knowing that the data is being processed by US arms company Lockheed Martin (whose fingers are in all kinds of other undesirable pies such as providing interrogators for Abu Ghraib prison and Guantanamo Bay, data processing for the CIA). But the data helps councils plan public services, and at this time of unprecedented attack on public services…..
I’ve come across a couple of responses. The first is conscientious objection. The second subversion. We are not willing to complete the 2011 census unless the data is not processed by present contractor Lockheed Martin, one of the largest arms producers in the world. We oppose all arms sales and do not wish to co-operate with or contribute to the profit making work of an arms manufacturer. Lockheed Martin makes and sells nuclear weapons including the Trident missiles for both the UK and US nuclear weapons systems. It is the lead contractor running the Atomic Weapons Establishment which both maintains the nuclear warheads and is developing a new nuclear weapons system. It makes and sells cluster bombs. The use of both types of weapon is illegal as well being immoral. We cannot allow our personal data to be processed by a US based company which carries out surveillance and data processing for the CIA and the FBI. Under the US Patriot Act the US Government can require access to the data held by a US Company. Lockheed Martin also provided interrogators for people detained outside the law at Guantanamo Bay. We recognise the value of past censuses for planning needed public services. This census will however not be reliable because some people will be deterred from completing if the data will be processed by Lockheed Martin. It is also likely that the people most in need of decent public services and equal respect will be undercounted. 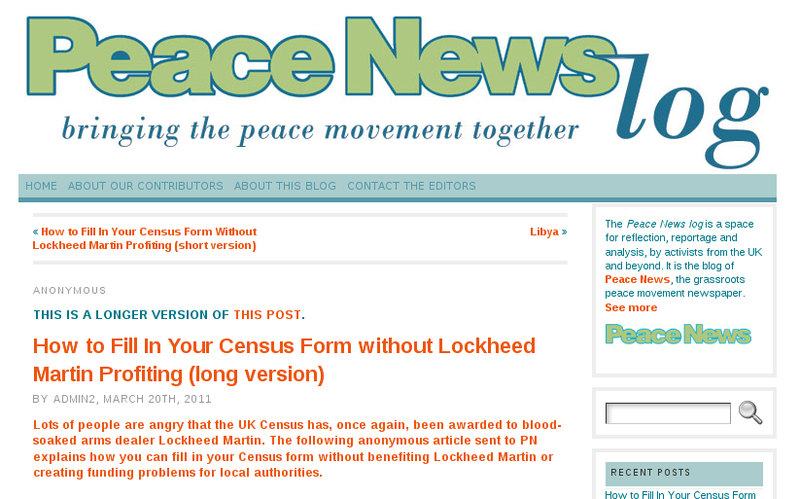 Those nice folk at Peace News have uploaded a couple of anonymous posts explaining how to fill in your census without allowing Lockheed Martin to profit or swelling the government’s coffers by up to £1000 if prosecuted and fined. Every minute longer spent on a form than Lockheed Martin has budgeted for, will reduce their profit on the contract. It is realistic to assume that this extra cost to Lockheed Martin would be in the region of £1 per minute of extra time spent on your form if all the overheads are taken into account.Let’s assume that they plan, using their high speed computerised scanning and data capture technology, to process a form in, say, 5 minutes from receipt at their processing centre up to finished data capture. If your form is going to take, say, at least 15 minutes because it is a little awkward to deal with (possibly longer if supervisory level staff has to resolve queries and problems), then you will have reduced Lockheed Martin’s profit by approximately £10, if not more. You can make it extremely time consuming by very simple means. The things some people get up to! I ask you……. The flaw with this being, Lockheed Martin do not process the forms. All they did was create the tracking system. Their job is done, dusted, and paid for. Lockheed Martin do not and will not see your completed forms. hey go to the ONS in Manchester for processing! By creating more work, you are making the census more expensive overall, and where do you suppose the money comes from to pay for this? Personally I prefer to take the ten mins it takes to fill it in, post it back, and never be bothered by it again… at least not for a decade. I must laugh at this idea to deliberately make the paper un-scannable by the software. Many people have a problem with the fact that their personal information is being recorded. Besides the obvious point that all this info and much much more is readily available to the government if they really wanted it, by writing badly and forcing a human to manually type in your details, well then your details will be seen. If you write legibly and allow the software to do its job, no one need see your personal details at all. Oh and on another note, if only for example 80% of people in your district return the forms, the local council, schooling, healthservice, libraries and all other public sector services, will only receive 80% of the funding they are entitled to… so if you failed to return your form, think twice before you complain about the state of your roads or the closure of your local library! Lastly, a friend of mine is working for the census this year, and her fear is that people will be rude and aggresive towards her when she makes calls to collect their forms. If you do happen to be contacted by Census workers, do remember they work for the ONS, not Lockheed, nor the government, so be civil! Thanks Ker. I’d suggest readers follow the links from the Peace News post to the official Census website and make up their own minds. One thing we’re definitely in agreement about is the need to treat census staff with the dignity and respect they deserve as fellow human beings. On occasion us activists can be guilty of scaling the moral high ground to such dizzy heights that we look down on others with a less than respectful attitude. A comment about Ker’s post. Forgive me for the length of what follows. It is important, but there is a lot to it. Ker’s post seems a bit incoherent and doesn’t actually address the issue properly. I first saw this post on the Peace News blog, and found it a bit odd, so I investigated. I followed all the links of people who posted comments and Ker’s identical post turned up everywhere, sometimes under another name. At that pount, a little alarm bell rung: I had heard of fake posts, by PR agencies on behalf of commercial or political interests. This is one of them, but not as subtle as I would have expected. We are dealing here with something called “astroturfing”. Below are 2 links to explain in much greater detail what this means. Basically, the PR industry has discovered that you can influence opinion by internet infiltration of discussion forums etc. by imeans of inserting fake comments which look as if they are made by real people. This is dangerous, because it can be effective. Yesterday I met someone who was actually taken in by some of those on the Peace News blog (there are several ones now). This particular one (Ker’s) is a primitive and unsophisticated one, which laboriously tracked links by hand. I searched, and found that it did not get all that far. I ran also a very simple check: put a characteristic phrase, with an oddly placed comma: “The flaw with this being, Lockheed” in the Google Advanced Search option of “this exact wording or phrase”, but no new ones turned up in addition to the ones I had al ready found. I think that the reason why there are not many more and much more sophisticated “astroturf” posts relating to the census and the Lockheed Martin contract is that there has been so little time between the date of the Peace news Blog (21 march) and the census date (27 March). The moment has long passed that anyone can do anything about it anymore. But, from point of view of Lockheed Martin, the stakes are very high indeed. The implication for internet social network sites is basically that as long as they deal with matters which do not threaten big vested interests, they will be left alone. As soon as they happen to hit upon something big, they become an astroturfing target. In a sense it is nothing new: everybody in the Westen capitalist world grows up with advertising and opinion- manipulating messages all round him/her as a natural environment. We have learned to ignore it all by and large. From the advertising poster to the tupperware party and then to astroturfing is a process of refinement by the PR industry to reach people at a more and more personal level, which will never stop. But on the internet, it will take us a bit of time to learn to deal with it, for it contaminates open and democratic sites. This is in a sense a science fiction world. When you encounter an astroturfer you are basically dealing with a robot – or an android – a manufactured, non-human entity. I know of 2 ways to catch them out. 2) The “Humanist” way: you detect the absence of truly human spontaneity, feeling and thought. There is a certain Dalek quality about the astroturfer (Yes, media studies at Uni and education in literature and poetry are important!). There is a clear economic dimension to it. You can’t cheaply mass-produce spontanous human speech and thought: it would be prohibitively expensive to try it. I firmly believe that this is a boundary the PR industry cannot cross. Authenticity is always hand-made and thus expensive. If it feels wrong, check it out. Everybody who writes has a “signature” he or she is not really aware of: a certain mannerism, a characteristic spelling or typing error, a recurring stock phrase, and so on. If you home in on those, you can trace astroturf posts even if they are cleverly changing (i.e. mutating) between one post and the next. I am a 61 years old computer dinosaur, and I am new to all this myself. Please take it away, improve it, and help to educate others. This is the new internet world which is now taking shape. Please tell your Canadian friends and relatives about it. Please tell your friends and relatives in Eire what they could do about it. More on the UK census FYI: ONS has been criticised for not including any questions on sexual orientation or gender identity YET AGAIN. This is important because councils and service providers base their estimates of where to spend their money on data from the UK census. With no information, it is harder for them to provide services to minority groups (or easier for them to forget about us). Local councils these days base their diversity strategies on Equality Impact Assessments, which get their data from the census. This has been identified as a problem by EHRC, and I’ve seen the results myself when checking out a local council’s EIAs: on every EIA form the section on LGBT reads: ‘no data’. Result: no prioritising, no services. The campaign to get this changed for 2011 was unsuccessful due to it being seen to be ‘too sensitive’ a question to ask people. Well, as a provider of services to the LGBT community it’s certainly sensitive to me, but I suspect that’s not what they meant.